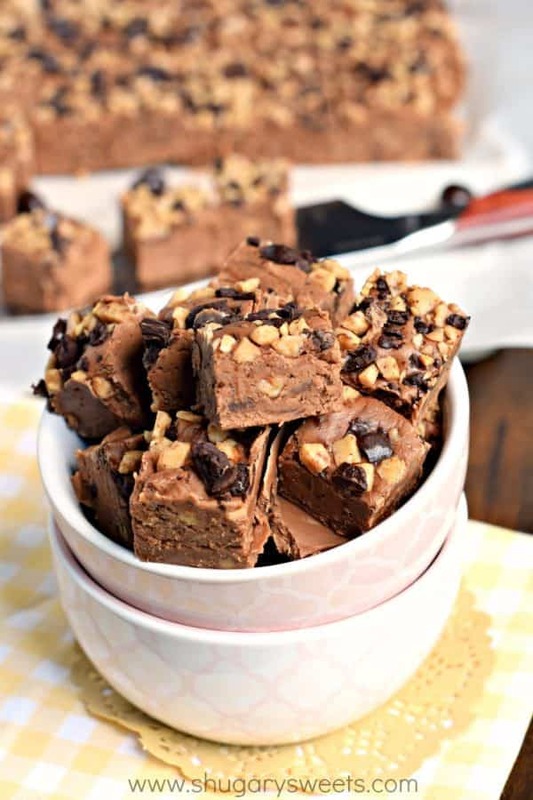 This Espresso Toffee Fudge starts with a creamy, decadent chocolate fudge base and is packed with crushed espresso beans, toffee chips and espresso powder. The perfect treat for the coffee lover in your life! You guys would be so proud of me, I’ve totally cut back on my coffee consumption. You see, I had this horrible addiction. I knew it had peaked when I got a Keurig to go on my nightstand so I could have a cup of coffee in the morning before even leaving my bed. I would brew a cup of Keurig while my coffee pot was brewing a full pot. Seriously, you guys, it had gotten pretty insane. I also realized that I love coffee creamer. And as the pounds started to pack on the past year, I’m positive the excess was because of all the coffee I was drinking (and all the creamer in that coffee). Because it certainly couldn’t have been all the desserts, hahaha!! So, this past fall we got the new Ninja Coffee Bar. It has replaced all our other brewers (Keurig, espresso machine and drip coffee) with the single coffee maker. While this is not a sponsored post, I will say, GO GET ONE. It’s fantastic. But more to the point, I decided I would try cutting back to 2 or 3 cups per day. While that may seem like a lot to some people, it’s definitely a reduction in my book! 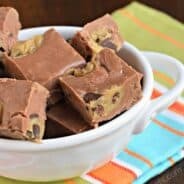 Which includes today’s Espresso Toffee Fudge recipe. You may remember awhile back I made this Salted Caramel Mocha Fudge. TO DIE FOR! Packed with creamy chocolate flavor a tablespoon of espresso powder, it’s truly delightful. 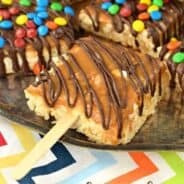 Add in the creamy caramel and it was a winning combo in flavors! Today’s version has the buttery flavor of Toffee combined with the robust flavor of coffee. I not only added in espresso powder, I took it a step further and crushed some dark chocolate espresso beans. I found mine at Aldi, but you can also get them at Trader Joes and Amazon! Don’t be giving this to people who hate coffee. While I like to sneak coffee into my chocolate desserts to enhance the chocolate flavor, in today’s fudge, the coffee flavor IS noticeable. And amazing. And if you’re like me and want to get coffee any way possible, this is a great recipe! It would also make a fantastic gift if you wrap it up in a pretty box (or MUG) and give it to a friend, teacher, or coffee lover! 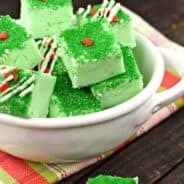 Check out some of my other favorite truffle and candy recipes and guide for how to make chocolate fudge! 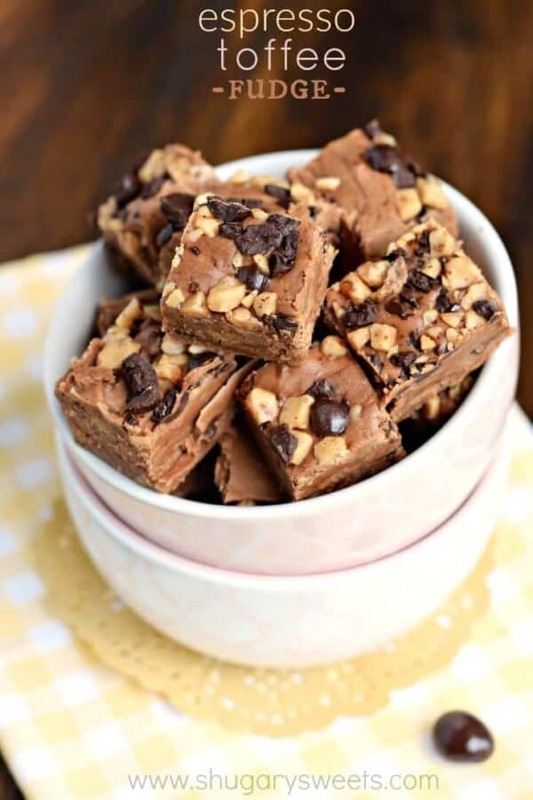 Be sure to stop over at Food Fanatic to print the Espresso Toffee Fudge recipe! I’m dying that you have a Keurig on your nightstand, yet thinking to myself that is a brilliant idea!!! I might have to go to the dark side. 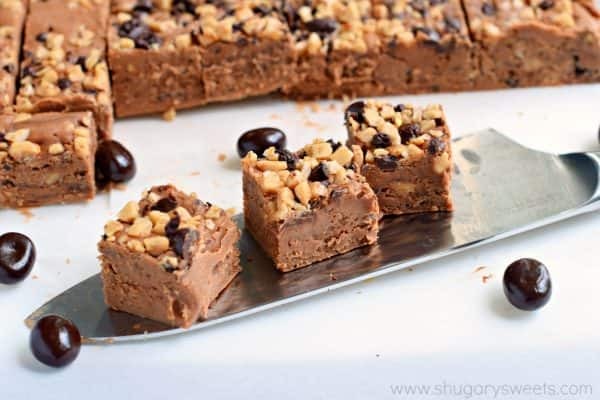 This fudge looks terrific! I can’t believe you have cut back so much on your coffee! You were/are such a coffee lover! LOL! And it still cracks me up that you bought that little coffee maker for your nightstand. I’m dying over this fudge! I love that you crushed espresso beans to add in it! Such a great idea! I have a coffee cookie fudge waiting in my que, but I just put the bean on top instead of in. Love that thought of the crunchy bite in it!!! Love the crushed espresso beans on top! I wish I had a couple of pieces to get me through this long afternoon! This is right up my alley, I don’t drink coffee but love dark chocolate covered espresso beans and the flavor combination of chocolate & espresso powder! This will be made in my kitchen very soon! I used to pound back chocolate covered espresso beans at 4am when getting my bakery ready to open????. These look amazing!! Can’t wait to try them! This past Christmas someone gave me chocolate covered espresso beans and I thought I had died and gone to heaven. However, this looks like it would be so much better! My daughter her friend and a Niece are huge Coffee lovers. I need to make this and pack it up and send as a Christmas gift with some of those chocolate coffee beans. Where would I find those and you really can eat them? Thank you so much. Yes you can eat them!!! I usually find them at Aldi or Trader Joe’s….but I bet you can order some from Amazon too!